Need some advice and knowledge on topics like digital signage, digital media, advertising and place- based content & services? Here are a few publications that we read when we need a boost of inspiration or we just want to check out what’s new in these areas. They’re different in many ways- from the industry they focus on, to the editorial style they adopt and the audience they address but they all have one thing in common- they are- on our opinion- reliable sources of information written by smart individuals, that will enrich your knowledge on a particular subject. 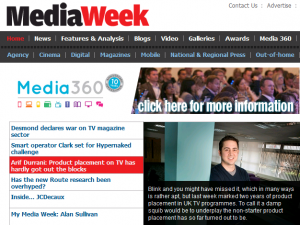 Adrian Cotterill & his team brief us every day about ‘’what’s hot in digital signage’’. Big projects, big installs are among the prevalent topics addressed along with career moves, M&A and CEO spotlights. Funny images spice up their articles at times. Their sense of humour and originality. The publication behind Digital Signage Expo– the largest international show dedicated to digital signage, and Out-of-Home Networks, taking place in Las Vegas each year. The Question of the Month: Each month, this section highlights a very practical question to which members of the community, a mixture of professionals coming from educational and financial institutions, media companies and other private organisations reply. We like the authenticity of the answers, as real people give real- life answers to the issue raised. This publication offers a very objective coverage on the most important novelties from the digital media signage sector as well as a rich archive of webinars, white papers and videos you can access for free, all focused on the application of digital signage in different industries. The content, the professional tone of their articles, their journalistic objectivity. As its title indicates, the publication covers news on the main mass- media channels: Television, Outdoor, National Press, Magazines, Radio, Digital and Cinema. Trustworthy, reliable source of information that offers a wealth of data on the evolution of different media channels. Led by Denis Gaumondie (Editor- in- Chief) from their Paris office, this bilingual publication (French- English) covers news from the out-of-home advertising sector that anyone with an interest in outdoor advertising, new marketing technologies and digital signage should read. Their rich knowledge of the French Digital-Out-Of- Home market and the concise style of their editorial. They describe themselves as ‘’the go-to-source for new ideas and inspiration for creative professionals’’. Honestly, it’s crazy what you can read on this website sometimes. Great to browse during your coffee break. 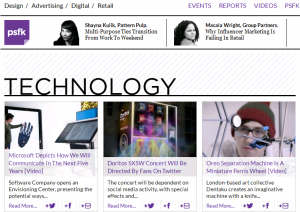 Their Digital & Technology section. Highly entertaining. 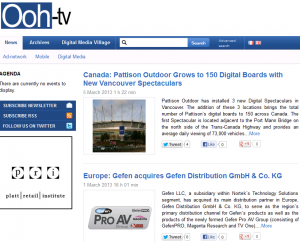 Canadian publication covering digital signage/ outdoor advertising news from around the world. They have recently ramped up their video content with shots from the recent Digital Signage Expo. Sixteen:Nine leverages Dave Haynes’s rich experience in digital signage who, together with other industry professionals, supports the ‘’Dooh Good’’ initiative – a project meant to facilitate the promotion of charitable causes on digital signage networks. Not just news coverage but also analysis, intelligence and expert insight provided by Dave Haynes. The website publishes news and commentary on hyperlocal content, commerce and technology. It doesn’t operate in the digital signage realm but it keeps us on the pulse of location- based communications. The content- providing us with tons of inspiration on the potential uses of location- based services plus a comprehensive review of what’s new in the hyperlocal ecosystem. ‘’Mobile is so hot right now’’ says its author, David Weinfeld and this is the main idea of his blog. David is Chief Strategy Officer of mobile startup, Screenreach and in his blog, he covers topics ranging from out-of-home media, mobile, social media and emerging Web apps. Reading the opinion of an expert on tangential areas to digital signage. A useful read if you’re passionate about mobile, web apps and social media. We’ve definitely missed many other blogs and publications worth reading, so feel free to share your favourite ones in the comments box below. 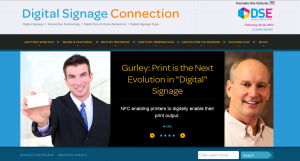 Want to learn more about digital signage? Download our white papers or register for our webinar. 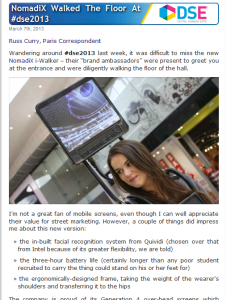 This entry was posted in Digital Signage, Marketing and Advertising, Tips and advice and tagged Chatter, digital signage news by Dynamax. Bookmark the permalink.